This statistic shows the results of a survey, conducted in 2017 in the United States, on Americans' New Year's resolutions for 2018. 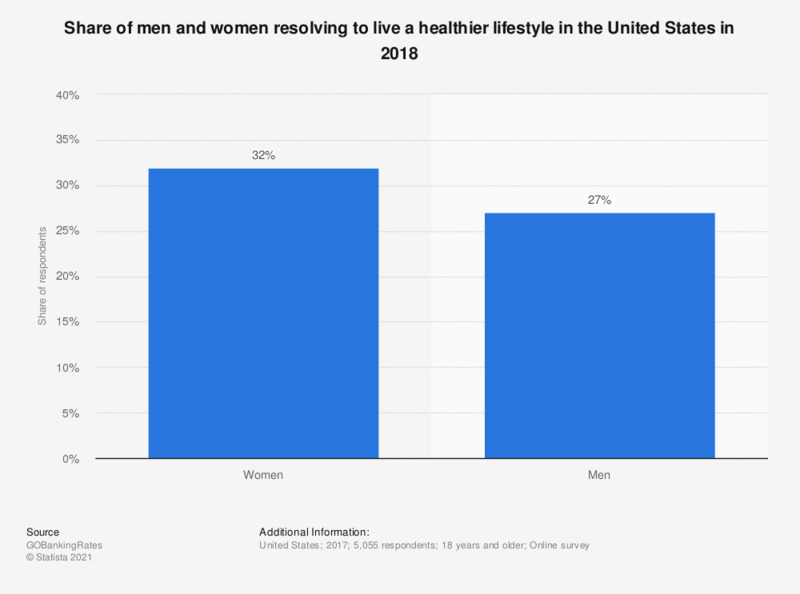 During the survey, 32 percent of female respondents said the resolved to live a healthier lifestyle in 2018. This question was phrased by the source as follows: "What is your 2018 financial resolution?" Respondents could choose more than one of the following answers: 1) save more, spend less; 2) pay down debt; 3) enjoy life to the fullest; 4) live a healthier lifestyle; 5) increase my income; 6) spend more time with friends and family; 7) none; and 8) other. National holidays in the U.S.
Statistics on "National holidays in the U.S."
Which of the following do you consider your top financial resolution for 2018?Leading financial resolutions for 2018 in the U.S.
What are your 2018 resolutions? Which of the following do you consider your top financial resolution for 2018? Do you think you'll keep the resolution you made for 2018? How do you plan to celebrate Independence Day this year? Do your family and/or friends celebrate Easter? Are you celebrating Easter this year? What is most important to you about Easter? Which of the following customs do you follow around Easter? Which of the following activities do you plan to do on Easter Sunday? Who are you going to give an Easter gift to this year? How much are you going to spend on Easter presents? If you don't know exactly, please estimate. Where will you be celebrating this year's Thanksgiving? How important is celebrating Thanksgiving to you? Who will you (mainly) be with on Thanksgiving? What will be included in your Thanksgiving dinner? How likely are you to shop on the Friday after Thanksgiving or Black Friday this year? When do you plan to start shopping for holiday gifts this year? Roughly how much money do you think you personally will spend on Christmas gifts this year? What are your 2019 resolutions? How many of the New Year's resolutions that you made for 2018 did you stick to? Do you agree or disagree with the following statements concerning your lifestyle? What does being “healthy” mean to you? Will you make some personal resolutions to do some specific things for myself or others in 2018? Do you think 2017 will be better or worse than 2016?